It can be coordinated with many Aqara devices. When the door is unlocked at home, the room will automatically light up, the water heater will be heated automatically, and the curtains will be opened quietly. These smart devices make the home more comfortable and warm. Connect with other intelligent devices through Zigbe e communication protocol, and the response speed is fast. The instability and interruption of the wireless network in the home will not affect the experience. The integrated intelligent home automation need to be realized through the gatewa y.
Q: Can I use AP P to unlock the lock remotely? A: There are some vulnerabilities in the Wifi router, which leads to the security risk of the remote unlock function being deliberately attacked by hackers. Therefore, our lock does not support the remote AP P unlock. 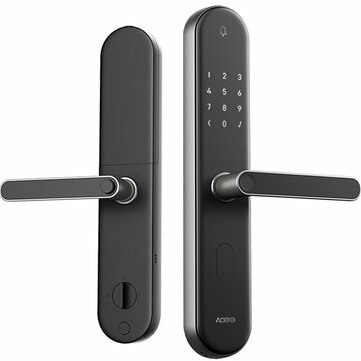 A: Without gatewa y, you can also input fingerprint, password, locks can be used normally. The gatewa y device can realize the coordinated control with other devices and then you can also check the lock status through the AP P application. Select the corresponding accessory kits according to the thickness of your door.